Several NPMA members are located in Baton Rouge and surrounding areas and have been affected by the devastating flooding last week. The flooding in Louisiana is likely the worst natural disaster in the United States since Superstorm Sandy in 2012. If you would like to support your Louisiana peers during this difficult time, click here to donate to the American Red Cross. 2 Weeks Left to Register for PestWorld 2016 and SAVE! Join NPMA and thousands of your peers this October in Seattle, Washington to earn recertification credits, hear from world-renowned keynote speakers, and discover new technologies in the exhibit hall. Register by September 4 to take advantage of early bird pricing for PestWorld 2016. 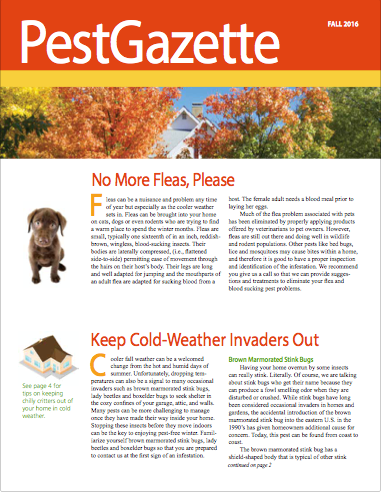 Fall is right around the corner and the Fall issue of Pest Gazette will help you give your customers and prospects a description of the various types of pests that may take over their home during the season. The Pest Gazette is customizable – you can add your logo, contact information and an article of your choice. Click here to view the current issue. Click here to fill out the order form or contact us at pestgazette@pestworld.org. National Fit Testing Service offers you an easy economical way to achieve OSHA compliance. At your convenience, National Fit Testing Service's technicians come to your site and perform Qualitative or Quantitative fit testing of your employees in accordance with OSHA Respiratory Protection Standard 29 CFR 1910.134. Help protect your valued employees health and well-being as well as comply with OSHA regulations, by scheduling your respirator fit testing and training session. Contact Linda Lane for special NPMA member pricing today! The U.S. Food and Drug Administration has approved the first field trial to release genetically modified Aedes aegypti mosquitoes in the Florida Keys. Aedes aegypti are responsible for transmitting deadly viruses such as dengue, yellow fever, chikungunya, and Zika. Genetically modified Ae. aegypti mosquitoes are engineered at the biotech firm Oxitec, who engineers mosquitoes for the purposes of vector control. Oxitec designs male mosquitoes to carry a unique ‘self-limiting’ gene that causes offspring to die before reaching adulthood. So when Oxitec males are released into the wild and mate with wild females, the resulting offspring cannot reproduce and local mosquito populations will decline. This gene is specific to Ae. aegypti, so it cannot be sexually passed to other mosquitoes and it cannot impact other organism that may feed on Oxitec mosquitoes. The plan in the Florida Keys is to release about 3 million Oxitec male mosquitoes, enough to out-compete wild male mosquitoes for the chance to mate with wild females. Similar field trials that have already been completed in Panama, Cayman, and Brazil have reduced the population of Ae. aegypti in test areas by as much as 90 percent. This technology could provide a sustainable control solution to reduce or eliminate dangerous populations of Ae. aegypti, and protect people from the diseases spread by this mosquito. Do you know a young entrepreneur in the pest management industry? Help them get recognized and nominate them for the NPMA Young Entrepreneur Award! NPMA is currently accepting nominations for the annual Young Entrepreneur Award, presented by Rentokil, recognizing young entrepreneurs (40 years of age or less) working in the professional pest management industry who have helped create or develop an industry business and/or those who have stewarded a meaningful industry concept to fruition. An independent judges' panel will select one award recipient who will be recognized at PestWorld 2016, Oct. 18-21 in Seattle. Deadline: All nominations must be received by 5 p.m. ET on Aug. 29, 2016. NPMA is now accepting nominations for the annual Women of Excellence Award, designed to recognize women who advance the pest management industry every day, in every way. Sponsored by Target Specialty Products, the international honor is open to women across the pest management industry - pest control companies, manufacturers, research organizations, etc. - who demonstrate outstanding leadership and have made notable contributions to the development and growth of the profession, their business, and other women in the industry. The recipient will be recognized at PestWorld 2016, Oct. 18-21 in Seattle. 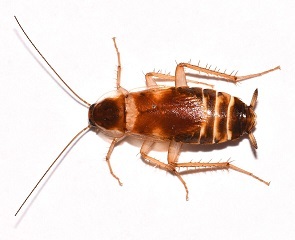 As a membership benefit, NPMA has developed a gallery of pest images for use by NPMA members. Click here to view the image use policy. Following the World Health Organization’s (WHO) August 2, 2016 determination that the United States is a Zika-infected country, Chinese authorities now require mosquito disinsection for all U.S.-origin shipments to China. Disinsection means killing live mosquitoes, their larva, and eggs. Fumigation is one type of disinsection, but spraying is another method of disinsection. Today, NPMA participated on a stakeholder call facilitated by the U.S. Department of Agriculture Foreign Agriculture Service (FAS). FAS reviewed the new Chinese Zika treatment guidance provided by the U.S. Embassy in Beijing following an August 18th meeting with China’s General Administration of Quality Supervision, Inspection and Quarantine (AQSIQ’s) Department of Supervision and Health Quarantine. During the call FAS officials highlighted two important areas very pertinent to the pest management industry. Click here for a sample certificate provided by China. As of August 5, forty other countries, including Mexico and Brazil, are subject to these requirements. This continues to be a very fluid situation and the process by which these regulations are implemented in China will most likely vary regionally. NPMA is actively engaging FAS, APHIS and the U.S. Trade Representative to provide assistance from the pest management industry when needed. Last week, NPMA hosted the American Mosquito Control Association (AMCA) at NPMA headquarters to discuss potential areas to collaborate and work together. AMCA and NPMA have been working together on Zika efforts on Capitol Hill this past year, and this meeting was a great opportunity to discuss future opportunities. Both AMCA and NPMA members are committed to protecting public health from mosquitoes and we discussed many opportunities for our organizations to work together towards this common goal. NPMA is looking forward to collaborating and working closer with AMCA in the future. Terminix President Bill Derwin recently resigned after serving three years with the company. Robert Gillette, Chief Executive Officer of ServiceMaster, will assume responsibility for leading Terminix effective immediately. Aluminum coil, painted to match the most common house colors. Flexible, easy to handle. Great for sealing holes. Click here for more information.